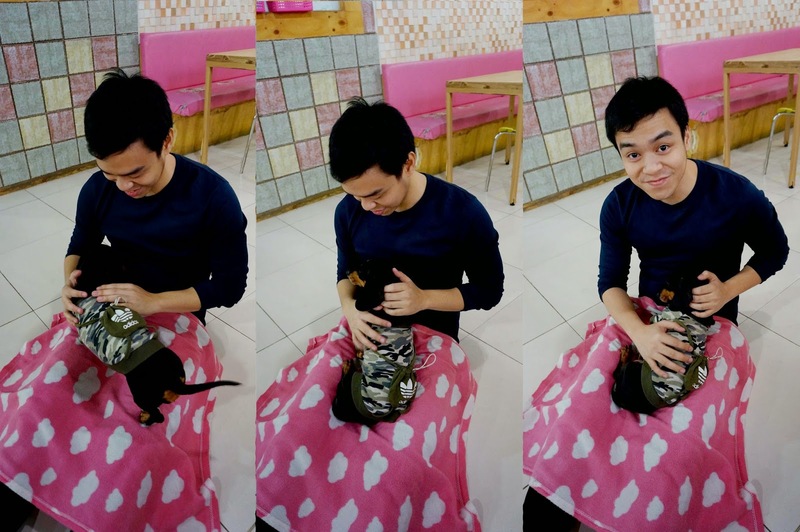 ChaMike cuddles dogs at a Dog Cafe. Mike is an ultimate dog lover. He had a pet dog named Spikey, a dachshund which he considered his best friend. Sadly, Spikey passed away last year and I saw how devastated Mike was more so as he wasn't physically there when the incident happened. 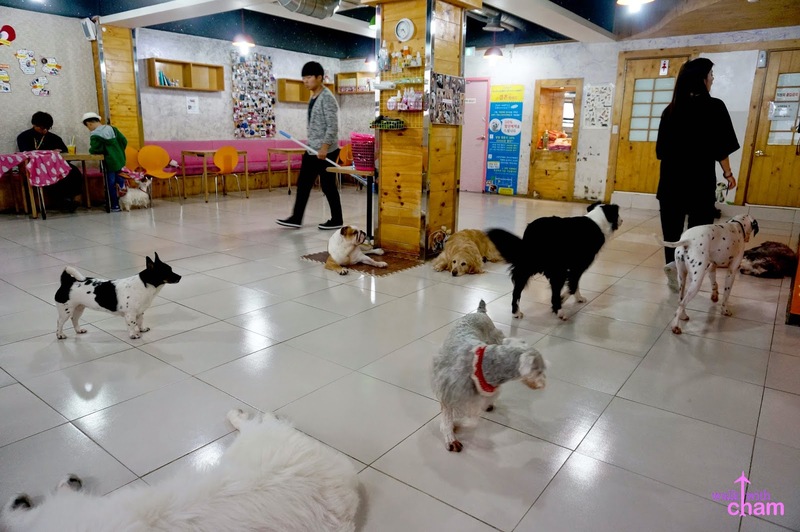 So when I saw the Krimmy couple post a dog cafe somewhere in Myeongdong on Instagram I immediately put that on my list. 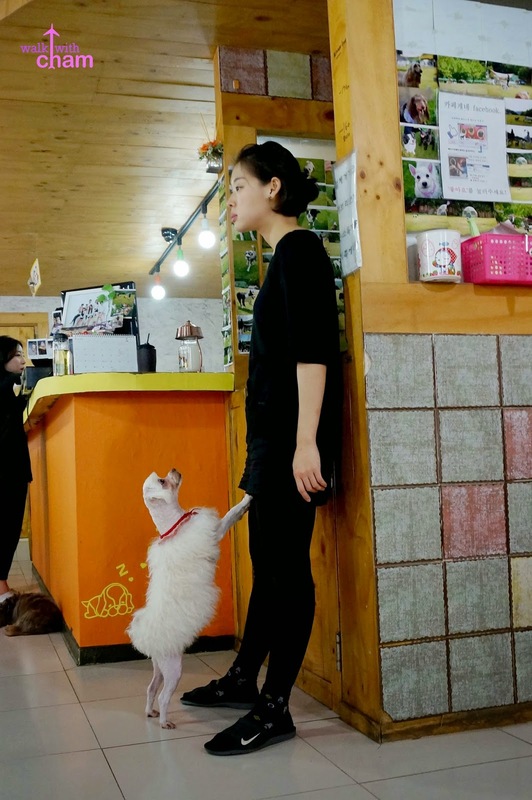 Seoul has quite a number of unique themed cafes and one of it is a Dog Cafe. 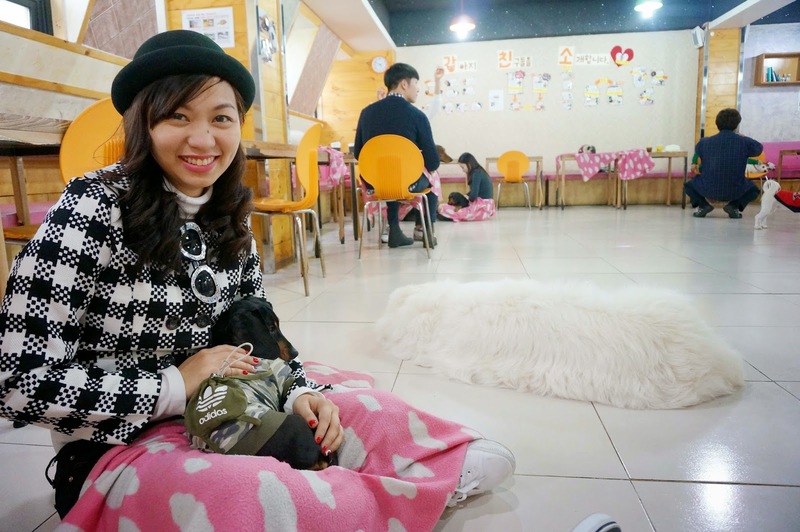 A Dog Cafe is a place where different breeds of dogs wander around and play with you while you drink your coffee. 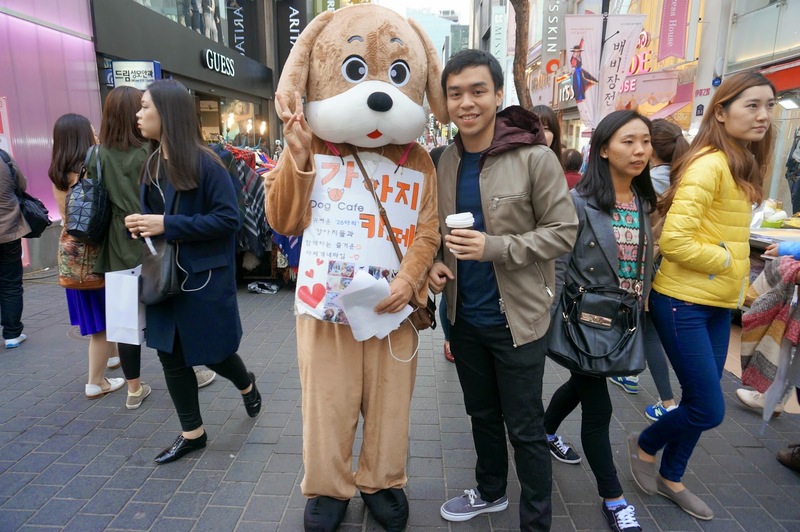 The name of the dog cafe where Krimmy went to is Wonder Dogs Cafe so when we found a dog mascot roaming around Myeongdong, we actually thought it was the dog cafe we were looking for. Myeongdong Station (Subway Line 4) exit at #7. 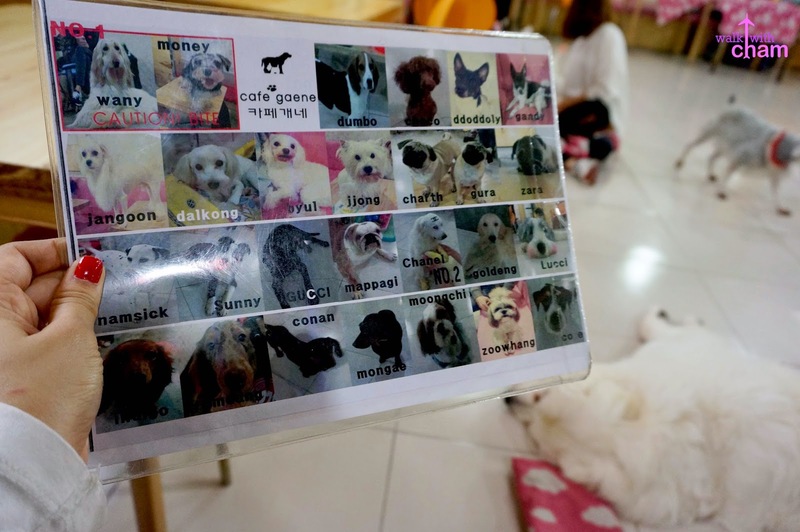 The Dog Cafe is located at the fourth floor of the very busy street along Myeongdong-6gil . 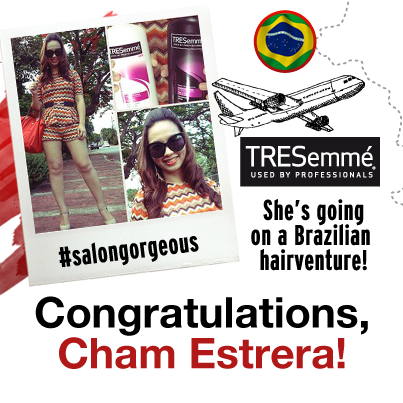 Just look for Beyond Beauty Shop and you'll see a signage like the one below. 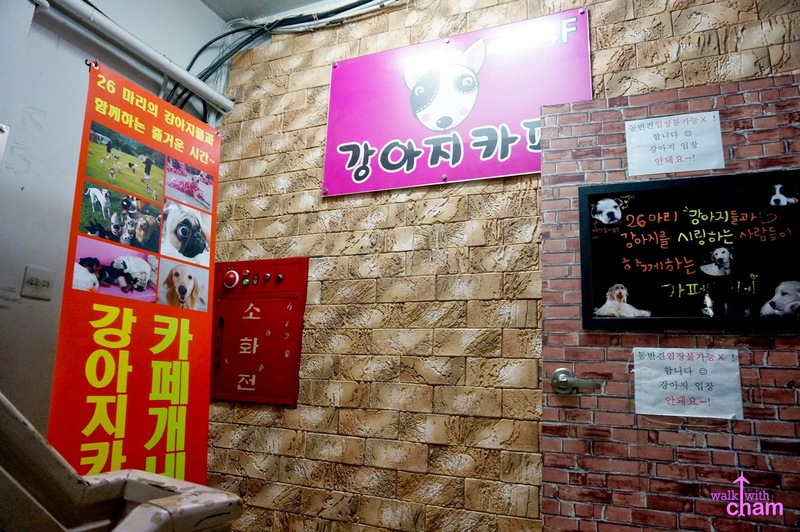 Because it was written in Hangul, Mike and I thought it was THE Wonder Dogs Cafe. 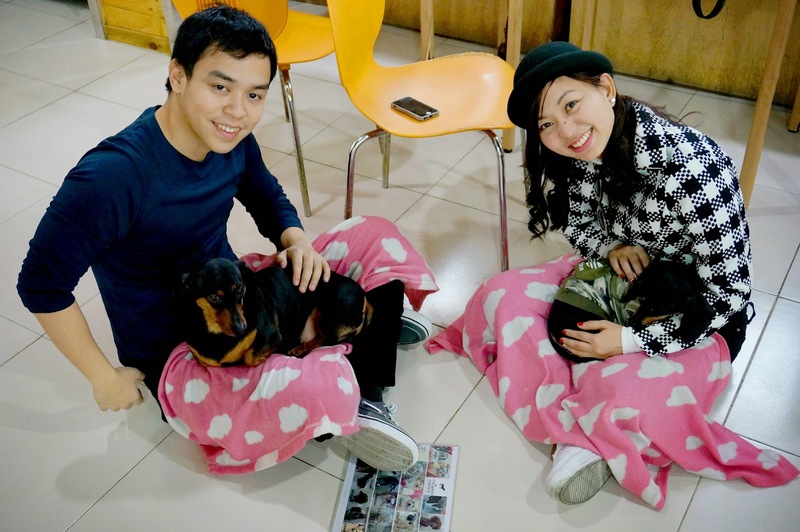 When we finally reached 4th floor, we saw a room full of dogs in different breeds. 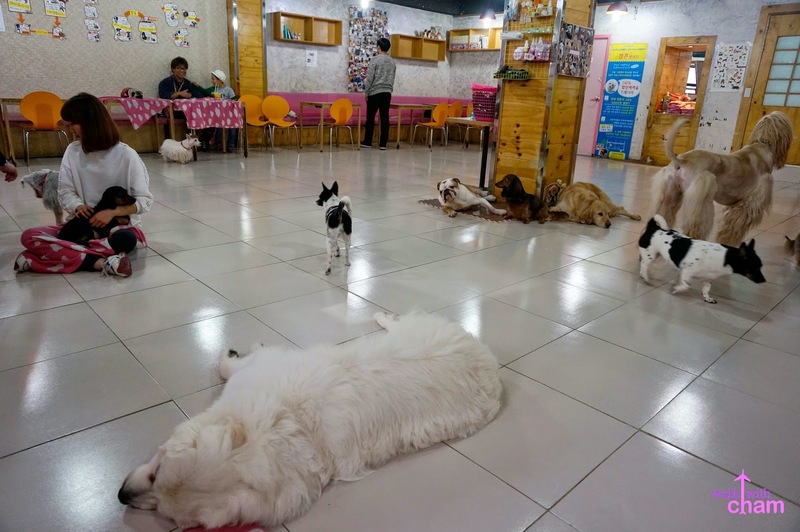 In my head I knew it was a different dog cafe. 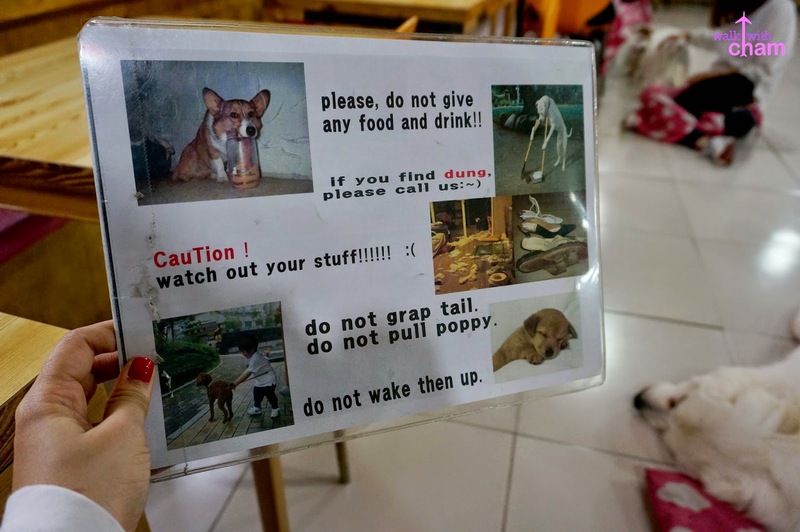 And I was right, it was not Wonder Dogs but Cafe Gaene. Honestly, the room (for a lack of a better word) stinks, the seats were worn out and you can see that the place was not well-maintained though the floor was clean naman. 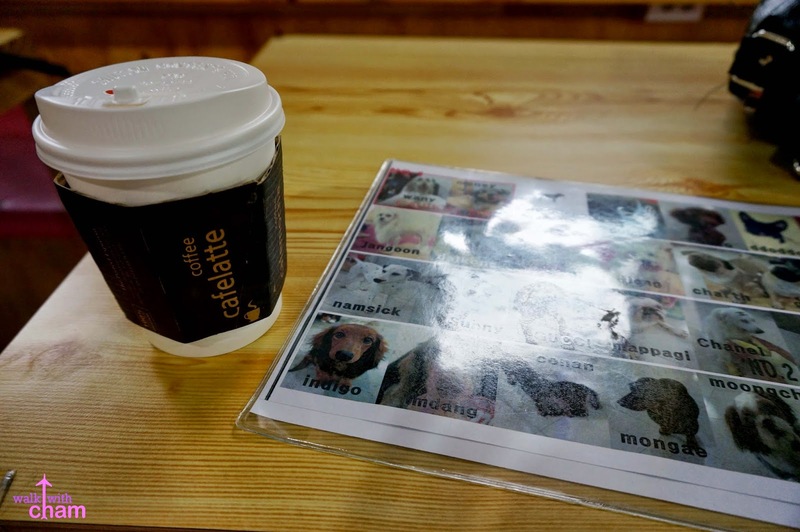 But because we wanted to experience a dog cafe in Seoul and if we skipped this one we may not have the chance to visit any other due to our tight schedule so we gave Cafe Gaene a try. 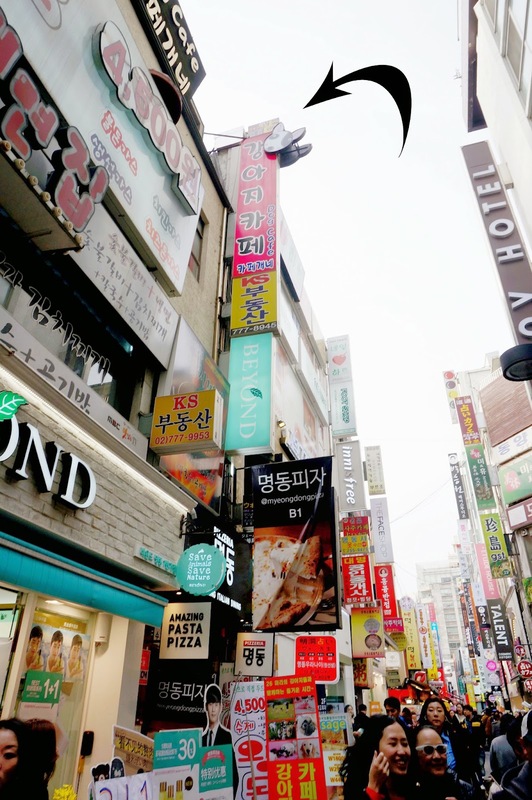 We were asked to pay 8,000 won (P320) as entrance fee inclusive of 1 drink. Because I'm not really a coffee drinker I ordered a chocolate latte. 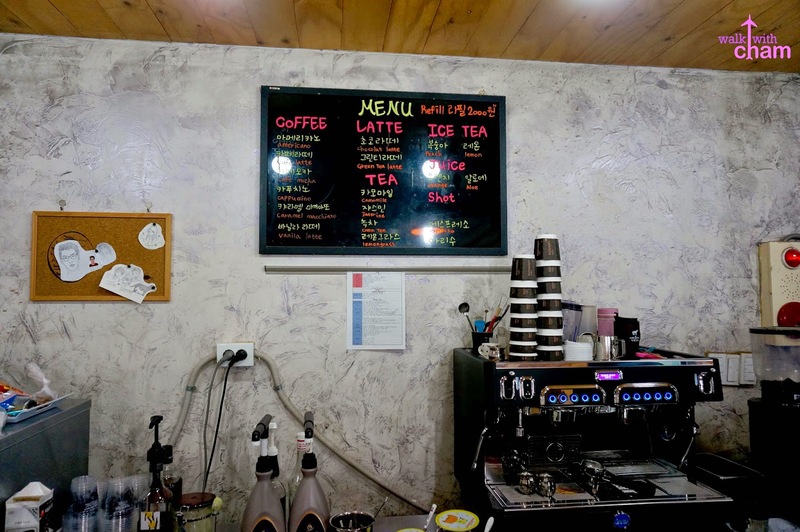 Aside from coffee they also have ice tea, hot tea and juices. There is a total of 27 dogs in different breeds. Mike became excited when there were 3 dachshunds roaming around- one small, one big and one hairy. Because we didn't want to sit on their chairs we opted to sit on the floor and lay a blanket on our laps. Instantly the small dachshund went walking towards Mike sat on his lap and rested. Mike was shocked as I was, his face lit up and gave me that infectious smile, my heart melted. It was truly a heartwarming moment. Oh the joy dogs bring! So while we were having our photo taken by the staff the big dachshund started walking towards Mike. Instant 'family' picture with our two dachshund babies!